Destination Recreation: University of Vermont Campus | Destination Recreation | Kids VT - small people, big ideas! What does a college campus have to offer a kid? As the daughter of a professor, I should know. My parents had little money to spend on babysitters when I was growing up, so I spent many a day off from school accompanying my father to Siena College in Albany, where his office smelled like musty textbooks and freshly brewed coffee. While he lectured about social work, I'd sit sheepishly in the back of the classroom, hoping his students wouldn't notice me. I loved visiting the different academic buildings with my dad as he went about his day. 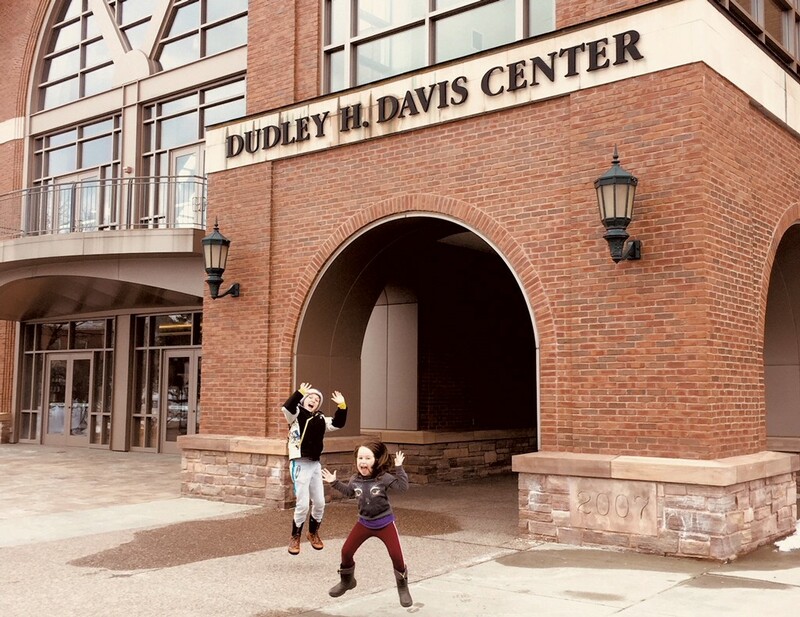 With fond memories of those early college visits, I decided to take my 10-year-old son, Henry, and 5-year-old daughter, Ruby, to the University of Vermont. We drive past UVM's main campus often, and my kids are always asking about college life. Do kids really sleep in those buildings over there? Why are college kids always carrying mugs of coffee? They've often wondered what's inside the Dudley H. Davis Center, the university's hulking student center right off Main Street. So that's where we started our adventure. We grabbed a free campus map at the main entrance — which is actually on the third floor of the building — and explored the center, which houses dining venues, student-group offices and large public study spaces. A large open staircase connects the building's four floors. Balconies offer sweeping views of the floors below and a colorful blown-glass sculpture entitled "Emergence," the work of UVM alum Ethan Bond-Watts. Down on the first floor, we came upon 90.1 WRUV, UVM's radio station. Looking through a window at a student DJ broadcasting live, my heart fluttered with college nostalgia. 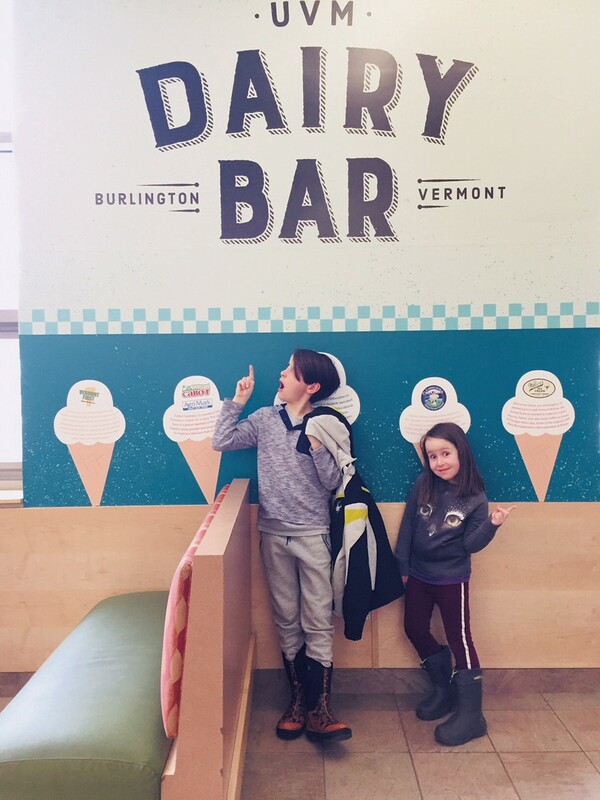 Another fun destination is the UVM Dairy Bar, which reopened in 2017 after an 11-year hiatus. The eatery, also on the second floor, was first established in 1950. It has a small selection of ice cream (eight flavors!) and smoothies made with milk from UVM's herd of cows, part of the animal science department. Kids can burn off their sugar high in the long basement tunnel that connects the Davis Center to other parts of campus. My kids were tickled when they learned they were running under Main Street. A few buildings down, the UVM Greenhouse, which can be accessed through Stafford Hall, is open to the public as well, save for a few areas designated for student labs. Exotic orchids, furry cactuses, and orange and lime trees fill the warm, humid space. Starting in May, the greenhouse sells annuals, starter vegetables and herbs. After warming up there, we headed outside to find the university's "stuffed animal" collection. 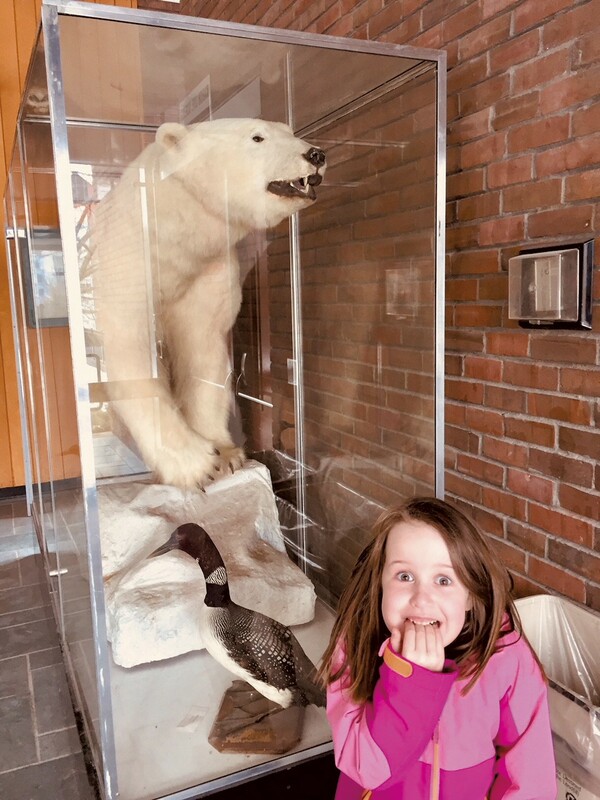 The sizeable, somewhat bedraggled taxidermy exhibit resides in an enclosed walkway between the Marsh Life Sciences Building and the Joseph E. Hills Agricultural Science Building. 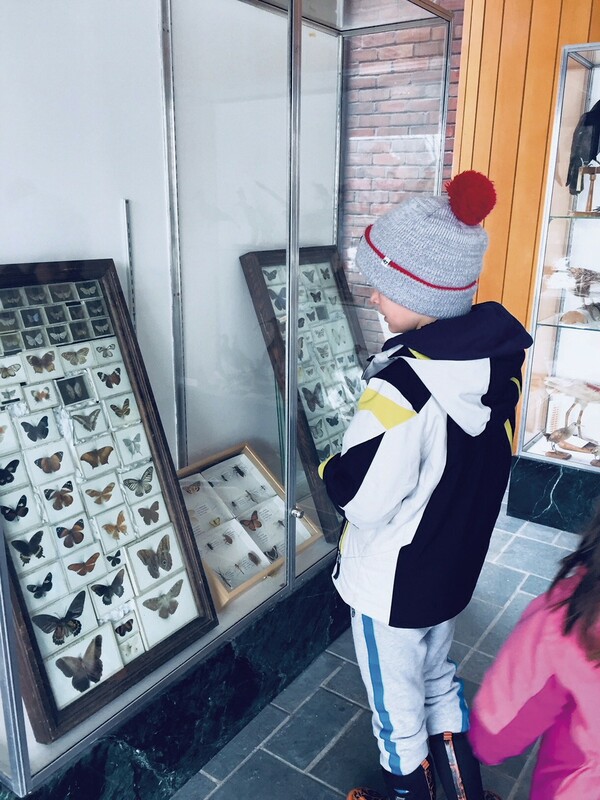 Both kids loved seeing the large polar bear, and Ruby was intrigued by the butterfly specimens. A bear and a scraggly looking mountain lion were also on display; we were all happy to encounter them stuffed and behind glass. 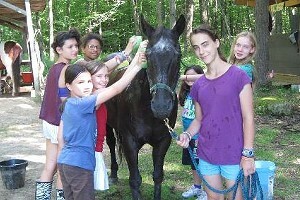 Finally, we stopped in the George D. Aiken Center, home of the Rubenstein School of Environment and Natural Resources. Budding environmentalists will love this "green" building, which was awarded LEED Platinum status for the sustainable way in which it was built. Each of its three floors represents a layer of the earth: core, surface and atmosphere. The building has signage that clearly explains each of these components, making it a fun and educational experience for both kids and adults — which pretty much sums up our whole trip to UVM. Metered visitor parking is located throughout campus. We parked in the large lot closest to the Davis Center, off Carrigan Drive. The Dairy Bar and greenhuse have limited hours, so be sure to check online (at uvm.edu) before you head out. While the UVM campus is open to the public, it's important to remember to use "inside voices" and respectful behavior when classes are in session. The Perkins Geology Museum houses a vast assortment of rocks, including geodes, and a fossilized beluga whale skeleton that was found in a farmer's field in Charlotte in 1849. Free and open to the public. Fleming Museum of Art is home to both permanent and changing exhibits. Open to the public, admission is $5 for adults, $3 for students and seniors, and free for children 6 and under.